September 19th, 2015, in the 3rd minute of injury time the Japanese rugby team spread the ball wide and scored a try defeating South Africa. It was the greatest upset in world cup history, sending the country into raptures and boosting the profile of the game within Japan to unheard of levels. 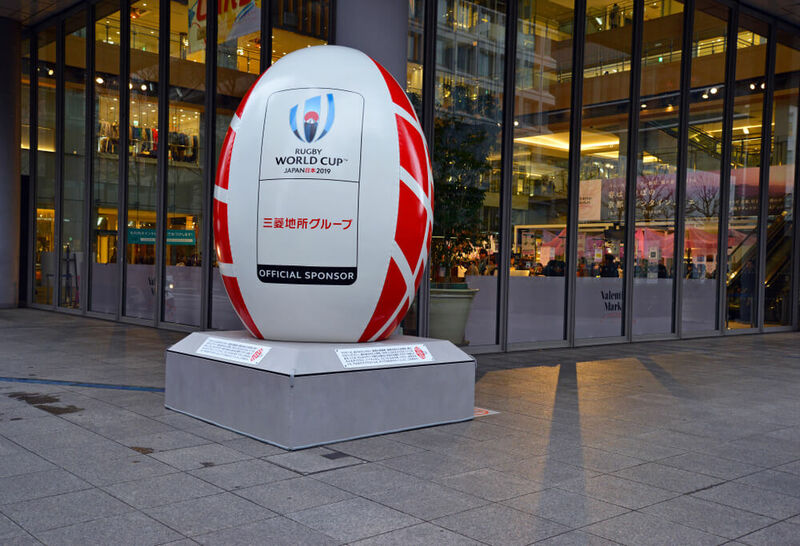 Now four years later in 2019 Japan will again make history and become the first Asian country to host the Rugby World Cup. In the weeks following the Japanese victory Goromaru the fullback and goal kicker becomes a national icon and it is almost impossible to go anywhere in Japan without seeing someone mimicking his distinctive praying-style kicking stance. A bronze statue is cast of him in Tokyo, he is given the title Master of Ninjas by the Japanese Ninja Council, he gets his own washing powder commercial, a buddha, said to resemble his kicking stance, becomes a place of pilgrimage and in a Shizuoka zoo a Giraffe is named, Goromaru. But the game in Japan has a surprisingly long history with the first depiction of a match in Japan in a drawing of 1874 which is two years before the Samurai were banned from carrying swords. Evidence suggests a rugby football club was set up in 1866 encouraged by British Officers stationed nearby who had attended schools in the UK where rugby was played. This predates the establishment of Japan’s first baseball team, Japan’s number one sport, by six years. 1866 is also two years before the ascension to the throne of the Meiji emperor which is regarded as the start of modern Japan, as such rugby can be said to predate even the modern Japanese era. In 2019 Japan is well prepared and excited to welcome an estimated 500,000 visiting fans, many of whom will be visiting Japan for the first time. South Africa V Canada – October 8th. Kyoto is a 24-minute standard train or 14-minute bullet train trip from Osaka which will host matches Italy v Namibia 22nd September, Argentina v Tonga 28th September, Georgia v Fiji 3rd October and USA v Tonga 13th October. On May 10th 2017 the world cup draw was held at the imperial state guest house in Kyoto. Those that want to follow in the footsteps of Steve Hansen, New Zealand’s Coach, can visit the gardens in the Imperial State guest house. For those wanting to call the gods to support their team Kyoto has its own rugby shrine. From September 2019 until November 2019 Arigato Japan will be holding a tour which will include a visit to the rugby shrine which is set within the grounds of Shimogamo Shrine, a world heritage site. 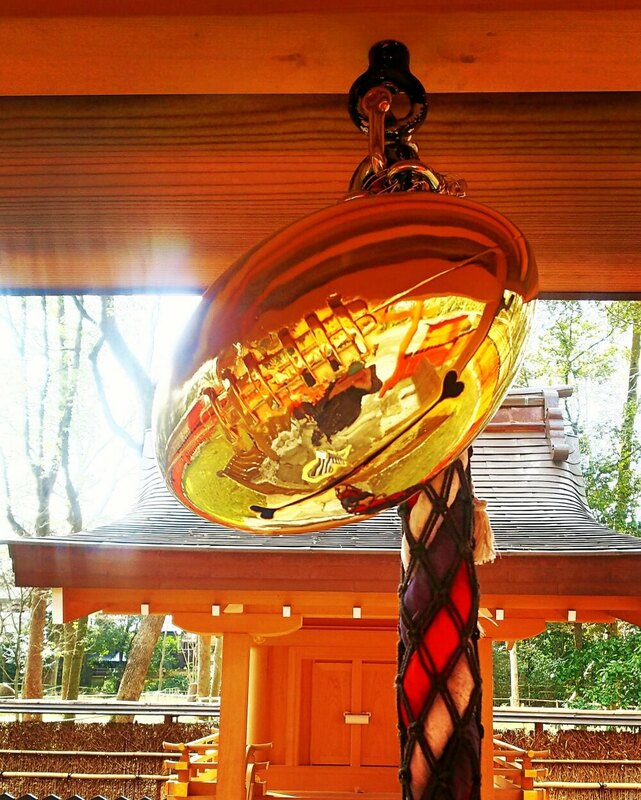 You can ring the new rugby ball shaped prayer bell and make your prayers for your team’s victory. 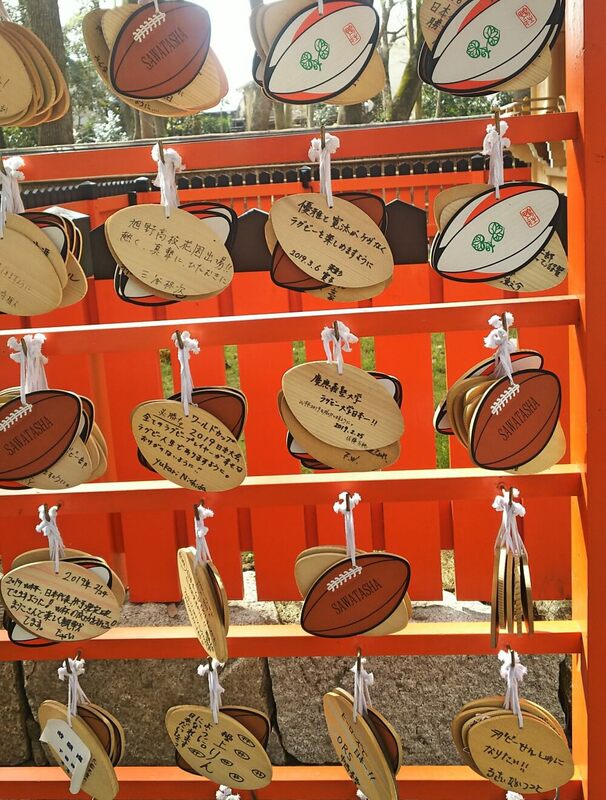 You can write your prayers for your team’s success on a rugby ball shaped prayer tablet and hang it on the shrine’s wall. The tour will also include some Northern Kyoto food specialities including mame (bean) mochi from the Futaba store, one of the most popular in Kyoto, saba sushi ,the local sushi style, from a shop at the end of the 1000 year old Saba Trail (Mackerel Trail) and try mitarashi dango (skewered rice balls in a sweet sauce) a nationally famous dish but which is named after the river which runs meters from the rugby shrine. Check back for details when this tour launches in May! And book your spot early. In the Meantime– If you are in Japan at the present time and are planning to view the cherry blossoms on Arigato Japan’s Kyoto Hanami tour you will also be able to visit the shrine as part of that tour.